Meet Jasmine .... a friend for life for your baby girl! An adorable Personalised Rag Doll, the most companion for every little girl from birth to adulthood that is guaranteed to become a treasured keepsake. This gorgeous Rag Doll can be personalised with your little Angel's name free of charge to make for a unique gift! Make sure your baby girl has a friend for life with our adorable Personisled Fairy Rag Doll, the most companion for every little girl from birth to adulthood that is guaranteed to become a treasured keepsake. This Fairy Rag Doll can be personalised with your little Angel's name free of charge to make for a unique gift! 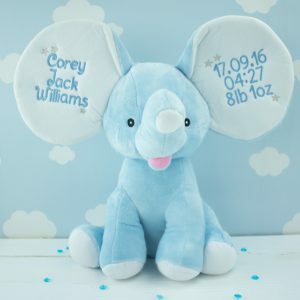 Your baby boy deserves a soft toy who is their best friend and one of the family, so look no further than our adorable Blue Dumble Elephant, ideal for every baby boys next best friend. These super cute soft toys are the perfect cuddle buddy for every baby and big kid they are so so snug and our biggest seller! 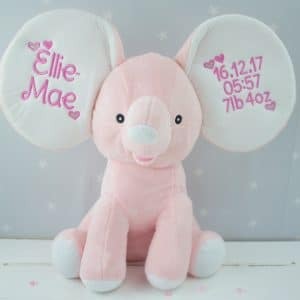 Your baby girl deserves a cuddly toy who is their best friend and one of the family, so look no further than our adorable Pink Dumble Elephant, ideal for every baby girls next best friend. This adorable gift can be personalised with your little one's all important details... simply fill in the text boxes below! 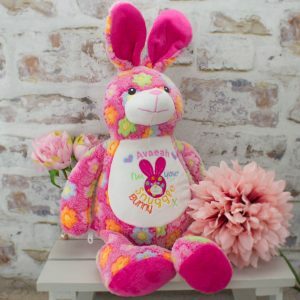 Our gorgeous 'Patchwork' Personalised Bunny Rabbit is the perfect gift for every baby girl to hold in her heart from the moment she lay eyes upon him, her fluffy fur is perfect for snuggles with your little one and will become a treasured keepsake with our free personalisation service! Check out our product photo gallery for different designs for the front of your bunny rabbit and select the matching one in the box below! Meet our Alice in Wonderland themed Rag Doll.... a friend for life for your baby girl! 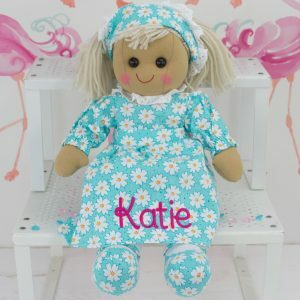 An adorable Personalised Nurse Rag Doll, the most companion for every little girl from birth to adulthood that is guaranteed to become a treasured keepsake. This Rag Doll can be personalised with your little Angel's name free of charge to make for a unique gift! 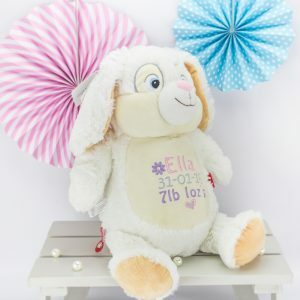 Our gorgeous 'Brampton' Bunny is the perfect gift to melt every newborns heart from the moment they lay eyes upon him, his fluffy fur is perfect for snuggles with your little one and I will become a treasured keepsake with our free personalisation service! Check out our product photo gallery for different designs for the front of your bear and select the matching one in the box below! Treat your baby girl to a best friend for life with our adorable Personalised 'Flower Girl' Rag Doll, the most adorable companion for every little girl from birth to adulthood that is guaranteed to become a treasured keepsake. This Rag Doll can be personalised with your little Angel's name free of charge to make for a unique gift! 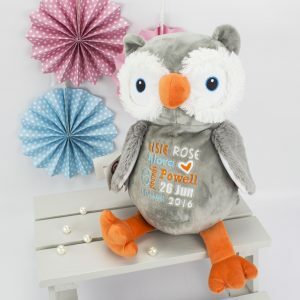 Gift a newborn all the way to a grandmother our simply stunning 'Hooty Lou' the owl, the perfect gift for that someone special in your life that can be personalised for that extra special touch! Check out our product photo gallery for different designs for the front of your bear and select the matching one in the box below! 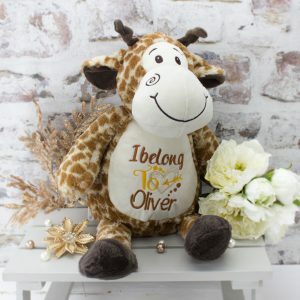 Our gorgeous 'Jeffrey' Giraffe is the perfect gift to melt every baby boys heart from the moment he lays eyes upon him, his fluffy fur is perfect for snuggles with your little one and will become a treasured keepsake with our free personalisation service. Check out our product photo gallery for different designs for the front of your giraffe and select the matching one in the box below... then simply add all the relevant information to the personalisation boxes! Meet Maisie .... a friend for life for your baby girl! An adorable Personalised Rag Doll, the most companion for every little girl from birth to adulthood that is guaranteed to become a treasured keepsake. 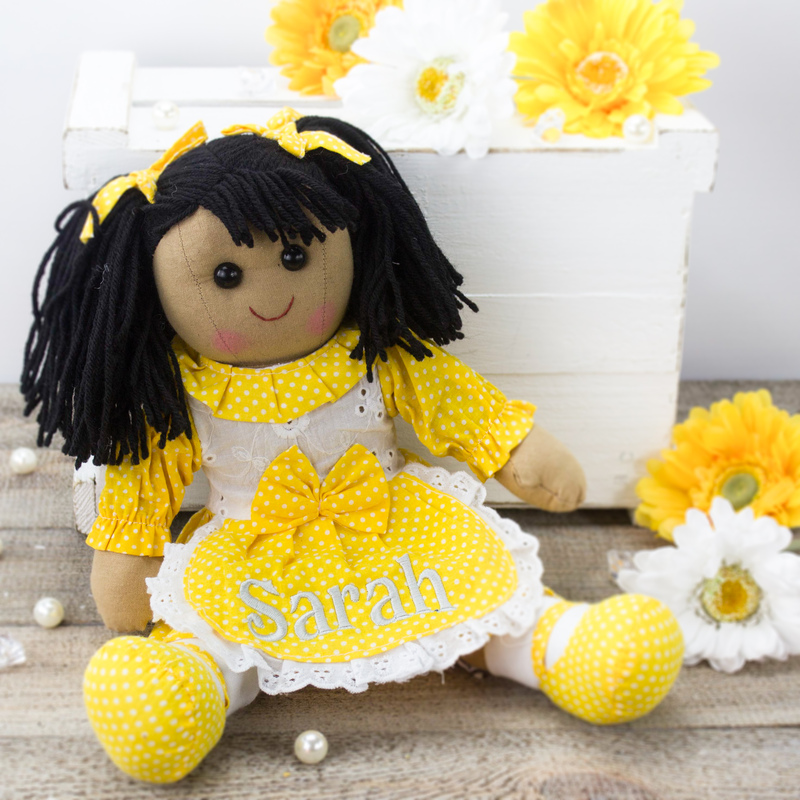 This gorgeous Rag Doll can be personalised with your little Angel's name free of charge to make for a unique gift! 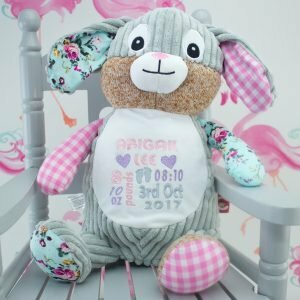 Our gorgeous Personalised Bunny Rabbit 'Ruby' is the perfect gift to melt every baby girls heart from the moment she lays eyes upon her. Her fluffy fur is perfect for snuggles with your little one and will become a treasured keepsake with our free personalisation service! Check out our product photo gallery for different designs for the front of your rabbit and select the matching one in the box below.... then simply add all the relevant information to the personalisation boxes!